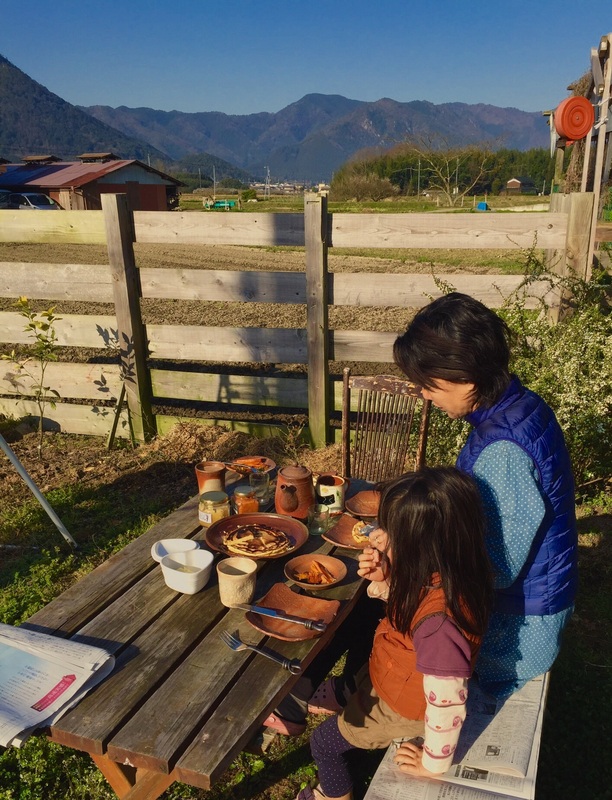 We had our first outside breakfast of the year this morning and it felt good! A bit chilly still but lovely warm sun on our faces. Our house always seems to lag behind the change in seasons by about a month – so whilst it’s coming up to the end of March outside, with cherry blossoms looming, we’re still burning the last of the wood in the stove in the evenings inside. 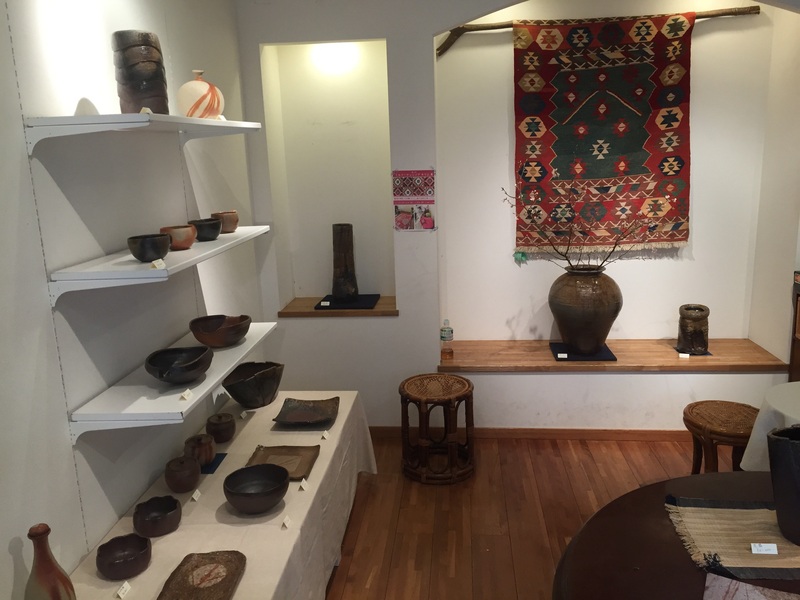 My exhibition in Dar Yasmine, in Osaka started today. As usual it was a bit tight getting all the pots cleaned up and ready in time! Moving from the workshop so quickly to the gallery I’m always struck by the contrasts of the different worlds that pots find themselves in, from the dirt and dust of being cleaned up after the firing to the pristine white shelves and lights of the gallery. 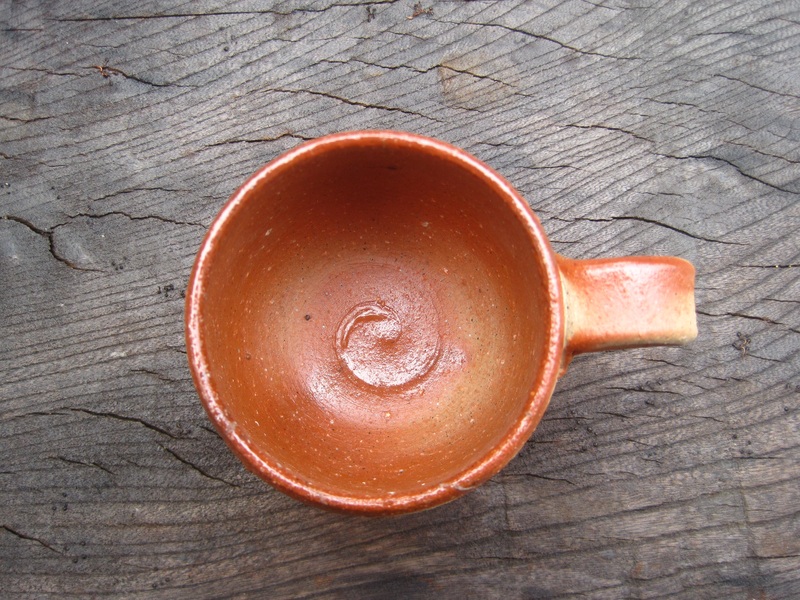 From clay to sales, it is truly an ongoing art of transformation. 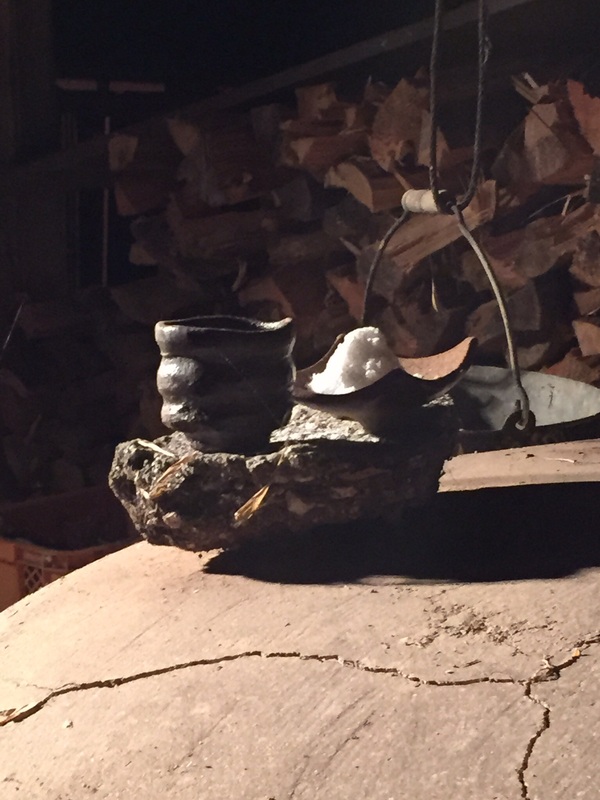 Just finished my winter firing, well a few days ago actually, and a few days to recover. There were one or two blips but in general it seemed to go well. It rained a lot, all day and all night for several days but at least it didn’t snow as it has done before. 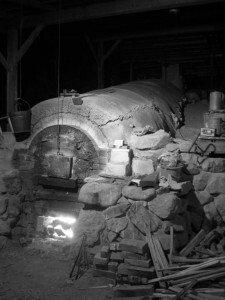 I’ll unload the kiln tomorrow, just in time for my exhibition starting on March 12th. More to follow soon…. For most of this year so far I have been getting up earlier than I would have believed possible a few years ago. Up at six, let the dogs out and then walk up to the workshop. It takes about ten minutes at a speedy pace and at that time of day it is invigorating to say the least. The main reason I’m up there so early is to light the woodstove in an effort to warm the place up to a workable level and that takes a while. I give the place a quick clean up, sweep the floor and then follows one of my favourite moments of the day, that first cup of coffee. Silence all around, not many people up and about and still a whole day of potential in front of me! I savour those few minutes! It’s all downhill from there on as I head back home for breakfast with my wife and daughter,and back into the real world…before returning to a hopefully slightly warmer workshop ! It was quite a good week for wood collecting last week. A Mr Sakai came round to see me to ask if I wanted some old pine boards, I said I’d like to take a look so the next day he took me to this beautiful 120 year old house 10 minutes down the road. 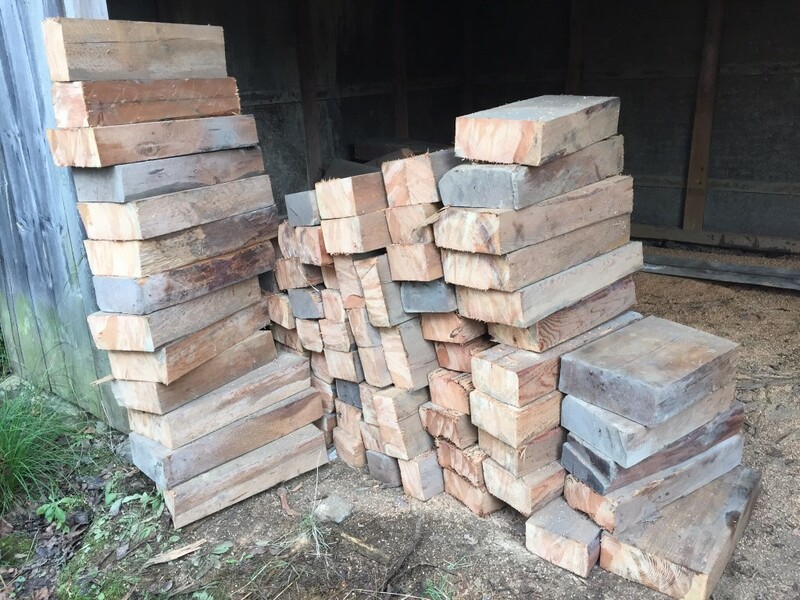 He’s the contractor on a major refurbishment job, and out the back was a barn with a dozen 4m x 12inch x 4inch pine beams – old, good wood, full of resin and well dried – just what I need to finish off a winter firing! Then a couple of days later another call, did I want some pine trees an electrical company just cut down? Yes please! So next morning at 7.30 Mr Tagawa brought them along in his truck and we off loaded them up at the workshop. Very fresh and wet so they’ll be drying for a while, but nice wood. adds up and I’m always grateful for it. Thank you people! 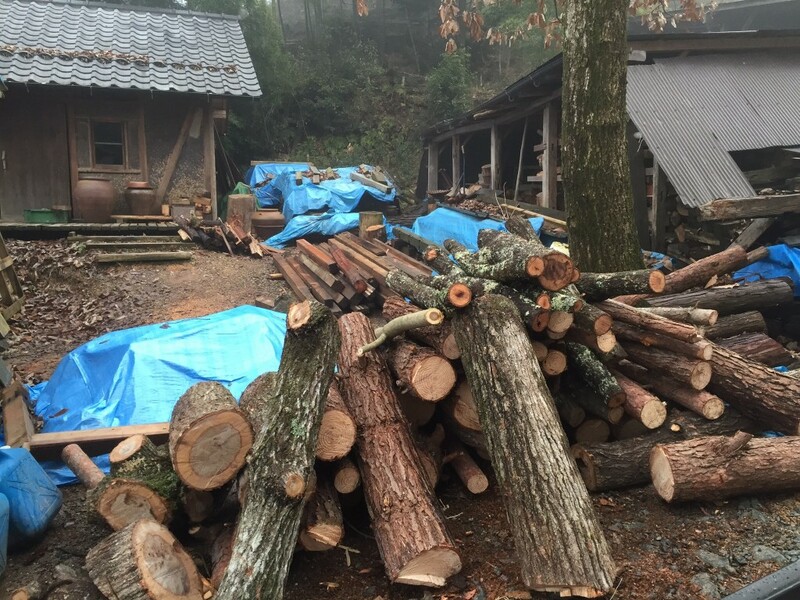 Fresh pine and oak (kunugi)!! Started making a couple of days ago. It always takes a while to get into the swing of things and I usually start off with something small to flex the fingers! Yunomis this time and most of them are destined for the front end of the kiln where they’ll get lots of well molten ash ! 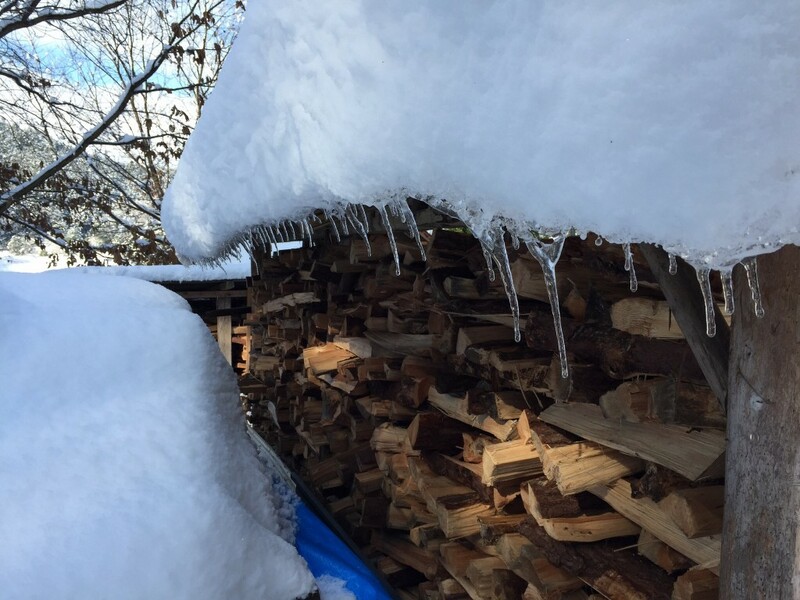 Wood drying under a foot of snow. 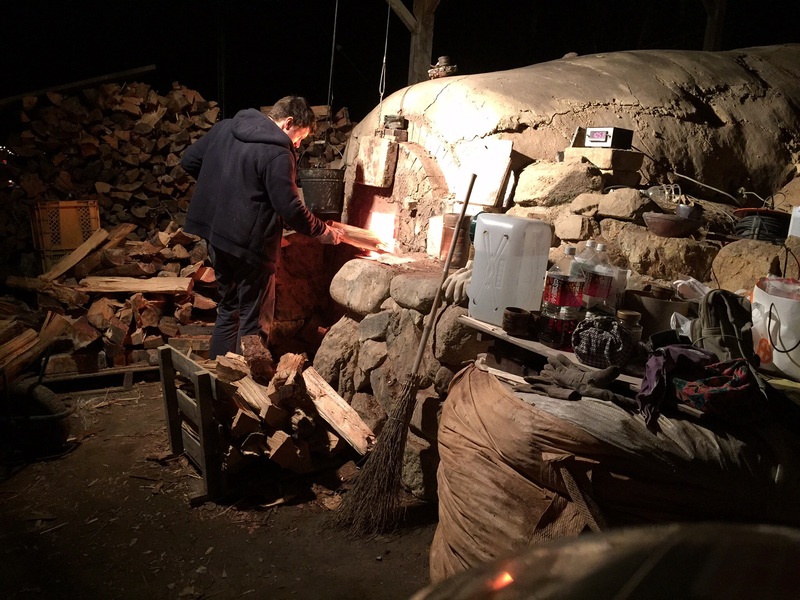 Making clay with the aid of the wood stove. 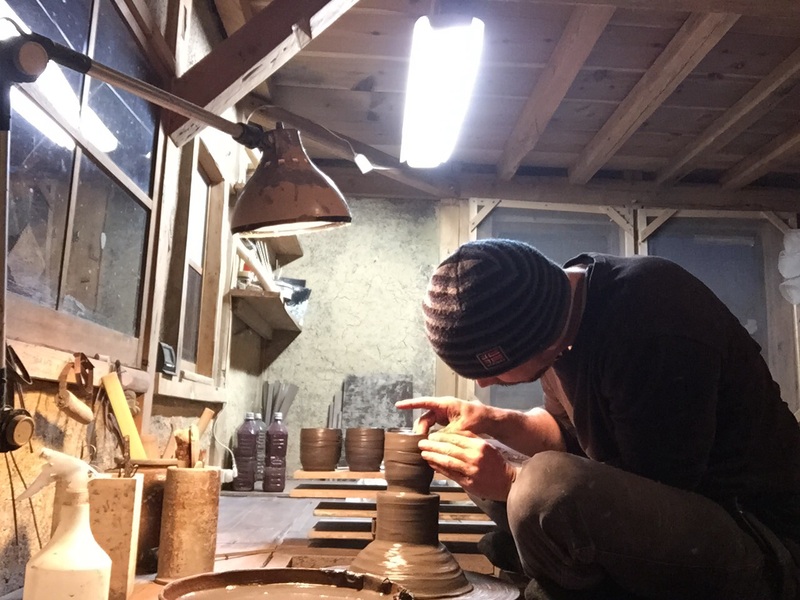 We had about a foot of snow over the new year period and though it’s pretty much all gone now it’s cold and wet outside and next to impossible to make and dry clay without it freezing solid. 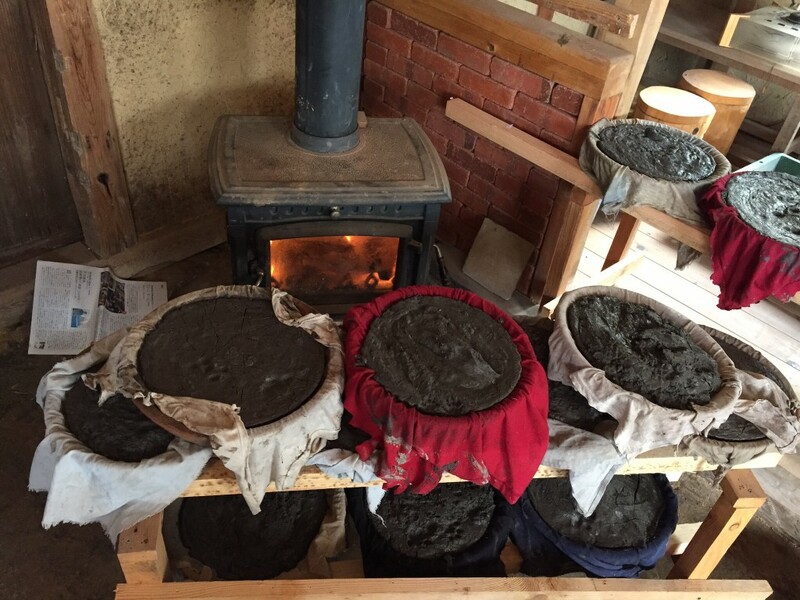 For the last couple of years I’ve been drying the clay in the winter in front of the wood burner in the workshop and it actually works quite well so long as I keep moving the clay around to dry it evenly. 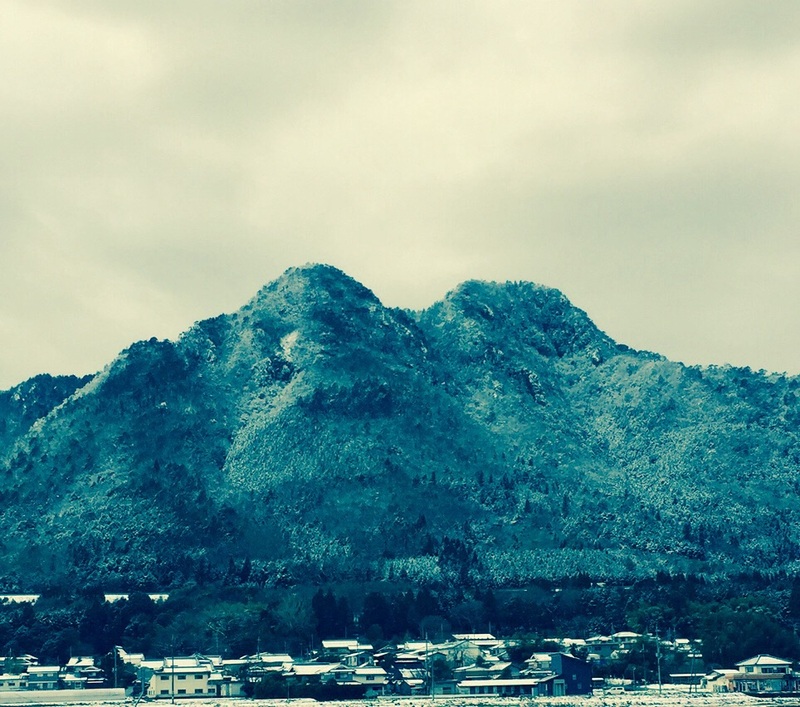 It always amazes me the difference in climate between Bizen and Tamba though they are are only 2 hours apart. 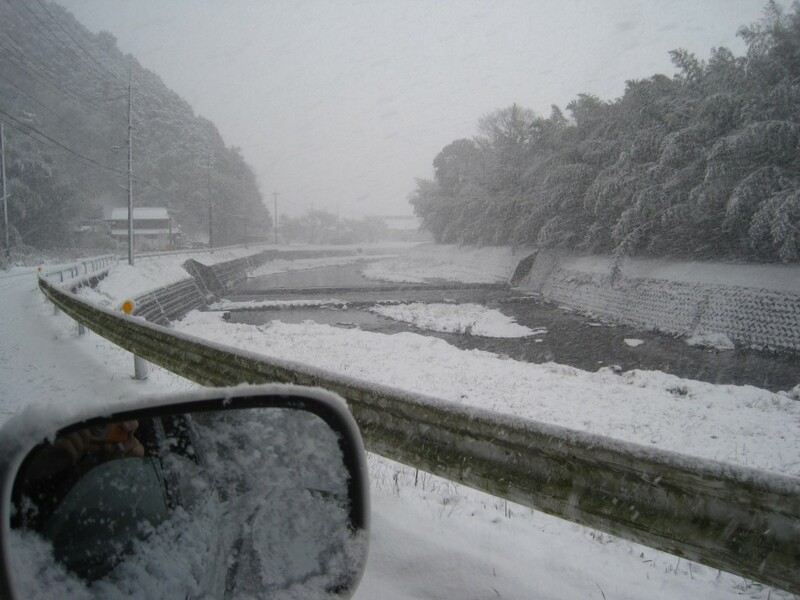 In 5 years in Bizen I think I saw snow settle once and that was gone almost straight away. Here we usually get 20-30cm falling maybe half a dozen times over the winter. Going down to Bizen the other day it surprised me how the kiln wood often isn’t even covered over the winter, just left out in the sun, the weather is that good. I hate to think what condition my wood would be in if it wasn’t under a roof. 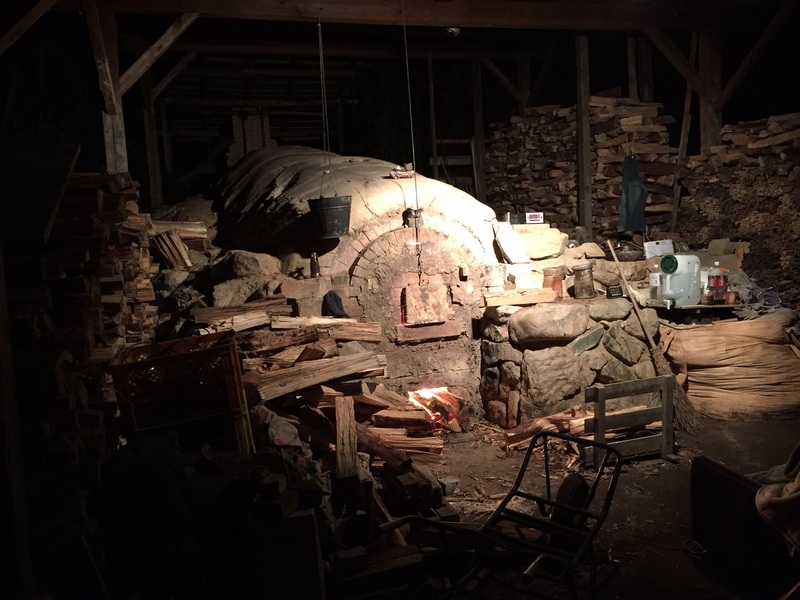 As it is I stack it as openly as possibe in the hope of it drying out somewhat by the spring, Still at least the workshop is nice and toasty! Thanks to anyone reading this, I’ll try to keep it well posted with the goings on of life as a potter in and around Tamba.